From left, Gerdau Vice President Darryl Moore and Vice President Mark Marcuccci receive a check from Consumers Energy Executive Director Julio Morales. JACKSON, Mich., November 22, 2017 /3BL Media/ - A Jackson manufacturer is being rewarded with an $100,000 incentive from Consumers Energy for its effort to help lower energy costs for homes and businesses across Michigan. 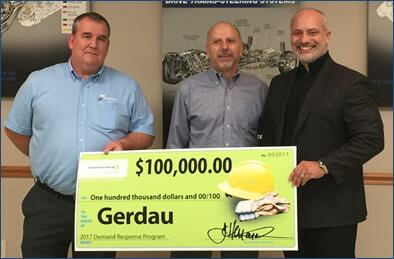 Jackson-based Gerdau today received $100,000 for participating in Consumers Energy’s business Demand Response program. The company reduced its energy use on some of this summer’s hottest days when the demand for energy – and the cost to supply and deliver that energy -- was exceptionally high. That reduces the need to build power plants or purchase expensive power during these high-demand periods. Consumers Energy’s business Demand Response program this year provided over $1.3 million in financial rewards to over 125 large businesses, such as factories or large municipal facilities. They reduced their energy use by over 90 megawatt-hours in total on those nine days. That’s about as much energy as 140 average Michigan homes use in an entire month. Consumers Energy also offers a program for households, Peak Power Savers, that encourages Michigan households to reduce energy use at critical times by cycling their air conditioners and taking other voluntary steps. Learn more: www.PeakPowerSavers.com. Gerdau is the leading producer of long steel in the Americas and one of the leading producers of special steel in the world. Gerdau’s North American special steel division, based in Jackson, produces high quality engineered carbon and alloy special bar quality steel bars for safety critical applications used by the automotive, commercial vehicle, construction, agricultural, distribution and energy markets.